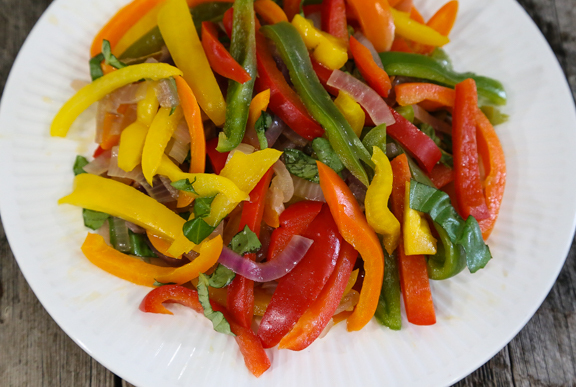 Cooking the bell peppers brings out the sweetness in them. Colorful and nutritious. Set a wok or stir-fry pan over medium-high heat. Pour the oil around the rim and swirl it to coat the sides. Add the onion and stir-fry for about 1 minute. Add the garlic, then gradually add the peppers. Continue to stir-fry for about 5 minutes longer, until the vegetables are tender. Grind in pepper and add the vinegar and basil. Season with salt and pepper. Serve hot or at room temperature.